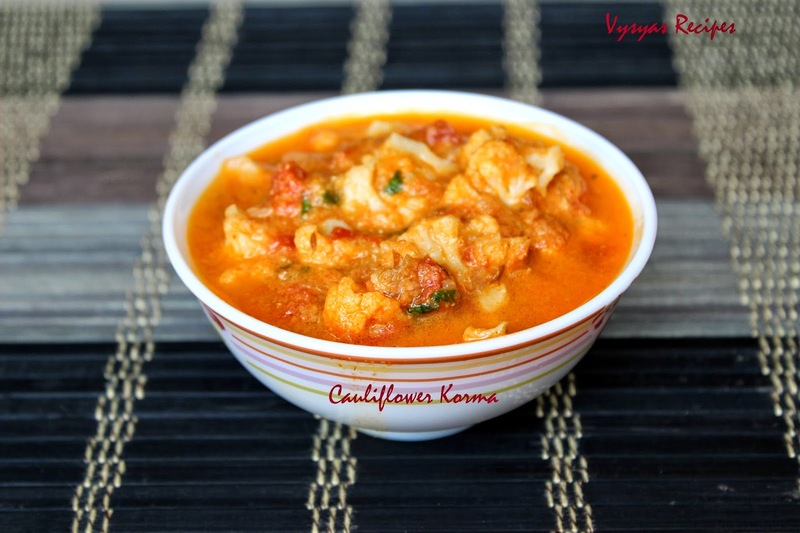 This cauliflower kurma goes very well with chapathi,roti,rice,dosa,poori and batura.This is a traditional korma variety.Cauliflower has multiple health benefits. Cauliflower contains many nutrients, making it an excellent addition to any diet.Cauliflower is a very good source of vitamin C and manganese, which are both powerful antioxidants. Cauliflower also contains vitamins B1 (thiamine), B2 (riboflavin), B3 (niacin), B5 (pantothenic acid), B6 (pyridoxine) and B9 (folic acid). It serves as a good source of proteins, phosphorus and potassium.Cauliflower is highly nutritious. Let us prepare simple traditional cauliflower korma. dry coriander seeds - 1 tsp. roasted chana dal(chutney dal) - 1 tbsp. Grind everything into a fine paste by adding little water. Cut the cauliflower into florets.Wash and soak the florets in hot water with little salt and turmeric for 5 to 7 minutes. Then drain the water and keep the florets aside. Heat the oil, add cumin seeds, when it splutters add chopped onions,saute well till it becomes pink. Add tomatoes saute well till it becomes mushy. Add cauliflower florets and saute for 2 minutes. Add ground paste with salt and required water according to consistency. Allow it boil for few minutes, till cauliflower is cooked and its raw smell goes. (cauliflower should maintain its crunchiness). Garnish with fresh cilantro.It serves as a best accomplishment for roti,poori, batura and parotta.